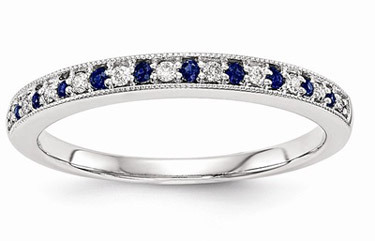 A breathtaking and exquisite collection of gemstone wedding bands for women, including sapphire rings, ruby, emerald, tanzanite, and more - all the precious gemstones that will make your wedding band dreams come true. And the good news? They are affordable and all very real, from Apples of Gold Jewelry. Apples of Gold uses only genuine, authentic gemstones for all of our wedding bands and rings set in solid yellow or white gold with the finest craftsmanship available. Every ring from Apples of Gold also comes with our signature 45-day return policy and free shipping. Order today and your ring will receive VIP treatment and delivery to your door, making your wedding dreams a genuine reality!